There's no denying that the best way to get better at something is to practice. Unfortunately with martial arts, most of the time we need to ​have a partner to train with, and that's not always possible. Of course, it isn't as effecting as practicing as on a real person, but it's a great way to practice new moves and ​get them stored in your muscle memory. How to Use a Grappling Dummy? Of course, using a grappling dummy won’t be the same as training with a real partner. They do however offer you the opportunity to develop your skills when there is no one else around. I will quickly touch on some of the main benefits and drawbacks of using a grappling dummy. ​Allows you to train your skills independently, even if you are unable to find a training partner. ​You don't stand a risk of injuring your training partner, nor will you be injured. ​You can run through drills for as long as you would like, whenever you like. This will allow you to engrain the movement into your muscle memory, allowing the moves to become second nature. This is especially important if you’re planning to compete, as you will not have time to think about each move, instead relying on instincts. ​Great for developing new moves, as you can run through the drill slowly and gradually build up momentum as you become more comfortable. ​They are weighted to give you as life like an experience as possible. ​Dummies can be placed into certain positions, allowing you to train specific throws, holds, submissions and sweeps. ​At most gyms, you will learn a move, then as you become more confident your training partner will gradually increase their resistance. This of course is not possible with a training dummy. 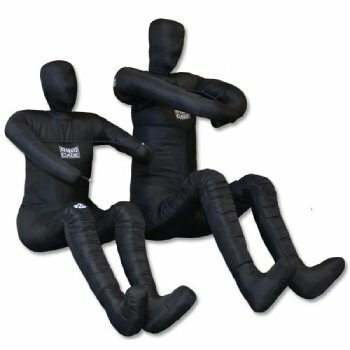 ​Grappling dummies tend to be expensive, especially high quality ones. There are a number of different aspects to be taken into consideration when looking to purchase the best grappling dummy for your needs. Flexibility is one of the most crucial components of a grappling dummy. A dummy with a stiff build will be more suitable if you’re looking to train your takedowns and strikes. Whereas the best grappling dummies for submissions will have flexible yet rigid joints. This will allow you to perform an array of drills from different positions and provide you with the most life like experience. For example, if you want to run drills from a guard position, you would need a grappling dummy that is able to be put into a kneeling position and stay there. The difficult part is finding the right amount of flexibility. Too much rigidity will make it hard to move the dummy into submission positions. Where as too much flexibility will make it too easy, and therefore an unrealistic training experience. The unfortunate reality of grappling dummies is that they tent to be pretty expensive. When spending this much money, it is important that you find a grappling dummy that is able to withstand a repeated beating. One way to assess this is to check what materials were used, which will have a direct correlation to the dummies durability. Different companies prefer different materials, which typically consist of polyester coated vinyl, military grade nylon and canvas. The best grappling dummies will have reinforced stitching along the joints in order to withstand the repeated submission training. Higher quality materials will often mean a higher price tag, which can be pretty daunting however these dummies will most likely last longer. Finding the right size grappling dummy is incredibly important and to be honest, confused me at first. You would expect to buy a grappling dummy that is of a similar weight to that of your typical training partner or opponent. When actually, grappling dummies tend to weight significantly less, averaging around 60lbs for an adult size. This is because grappling dummies are essential a dead weight as opposed to an actual person who is alive and moving. Grappling dummies can come either filled or unfilled, with most manufacturers offering a choice between the two. I always recommend buying a filled dummy as it saves a tonne of time and hassle. However, if you’re interested in saving a few bucks you can buy and unfilled one and fill it yourself. 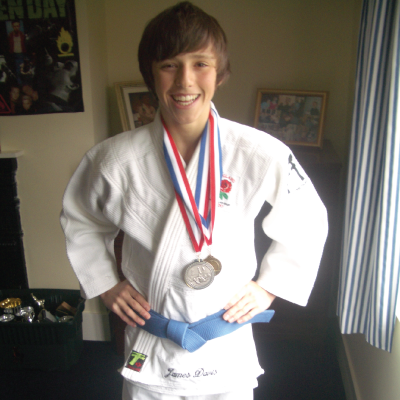 Can it Wear a Gi? The best grappling dummy for Judo and BJJ will have the ability to wear a Gi, which of course will provide you with the most life like experience. If you only compete in non-Gi tournaments, MMA or wrestling then this won’t be an issue. The best grappling dummy for your training needs will depend on what areas you’re looking to develop. There are two main types of grappling dummies, designed specifically for different areas of martial arts: throwing & striking and grappling & submission. 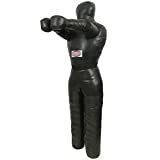 Throwing & Striking dummies are usually stood up or in an upright position, which makes them perfect for either striking or practicing take downs. These are designed to drill submissions from the ground, for example from the guard and side control. Grappling & Submission dummies tend to be lightweight and unable to stand up, which makes them ideal for groundwork. The Ring To Cage Deluxe is quite possibly the best grappling dummy on the market right now. In fact, it was recently rated as the top grappling dummy in Jiu-Jitsu Magazine, so that’s saying something. You have the option of both filled and unfilled, however I would suggest going for the filled option, as it is a hell of a lot easier and quicker to set up. Having said that, the unfilled version is $100 cheaper, so if you’re looking to spend on a budget, could be a good option. A common and cheap way to fill the dummy is using textile rags and using something like a broom to squish them in. The Ring To Cage dummy is also available in both youth and adult sizes. The adult size is the height equivalent of a 6ft person, weighing between 70-75lbs when filled. The smaller size of the Ring To Cage Dummy is also one of the best grappling dummies for kids. It has the height equivalent of 4ft 6inch tall person and weighs approximately 35lbs when filled. The Ring to Cage Dummy is the perfect way to work on your ground work without the need of an actual training partner. Unfortunately, it can’t stand up on its own so isn’t really suitable for striking or throwing. With some other dummies, the neck to shoulder ratio can be way off, making it near impossible to do certain moves such as arm or leg triangles. Luckily, this isn’t an issue with the Ring To Cage Dummy as its entire body is in proportion. The dummy itself is built to an impressive standard, using high quality 22oz polyester coated vinyl and reinforced stitching along the seems. The polyester prevents the dummy from absorbing sweat and makes it a lot easier to clean than other dummies. Overall, you’ll struggle to find a better dummy to help improve your ground game and submissions. If you want any more information, head over to our full Ring To Cage Grappling Dummy review. 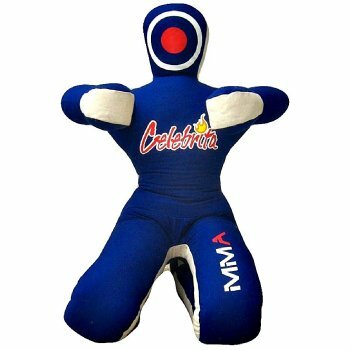 This version of the Celebrita Grappling Dummy comes in a sitting position that’s designed for training on the ground. Although coming in a kneeling position, the limbs of the dummy can be moved into different positions where they are able to hold their shape. This in turn allows you to practice different moves with your partner/dummy in multiple positions. Like most other grappling dummies, the Celebrita comes in both a filled and unfilled options. It’s worth noting that the Celebrita is slightly easier to fill than the Ring To Cage model and doesn’t take quite as long either. As well as this, the dummy also comes in an array of sizes ranging from 40” to 70”, making it one of the best grappling dummies for kids, youths and adults. I will quickly go over the size and weights of the different options and go over whom each one is suitable for. Although it may be tempting to go for a smaller version in order to save a few bucks, a lot of people end up regretting it. It’s best to go for a size that you feel is suitable; otherwise you won’t be able to get the most out of your training dummy. The Celebrita Grappling Dummy is available in two different materials. The first option is a high quality canvas material that’s both long lasting and tear resistant. Unfortunately, this canvas material absorbs a fair amount of sweat and is kind of difficult to clean. If the dummy does get sweaty, try and leave it outside for a few hours to air it out. Luckily, there is also a leather option that I would definitely recommend as it’s a lot easier to clean and doesn’t absorb as much sweat. A target is printed onto the head, allowing MMA fighter to practice their ground and pound alongside their other ground work drills. As well as this, the dummy is also available in an array of colors consisting of, red, blue and black. To summarise, it’s easy to see why so many people deem this the best grappling dummy for groundwork. It’s available in a tonne of different options, it’s incredibly long lasting and is one of the most versatile dummies on the market. For anymore information, check out our in-depth Celebrita Grappling Dummy review, where we take a closer look at both the sitting and standing models. Moving onto the next Celebrita model on our list. This version’s a lot more versatile than the model we just discussed as it’s in an upright position, meaning that it’s suitable for both stand up and ground based drills. As with most Celebrita products, the grappling dummy is available in array of colours, fabrics and sizes. As I mentioned earlier, I much prefer using leather dummies to canvas dummies as they absorb far less sweat. Unlike the previous model, the standing dummy by Celebrita comes unfilled and requires you to do this yourself. The only exception to this is with the 70” version, which is the only filled option available. As always, make sure that you get the right size and weight for your ability and needs. Getting a dummy too heavy will make the drills over strenuous, whilst a dummy too light will make it too unrealistic. As you can see, there’s a target printed onto the head of the dummy. This is more for aesthetics, but does provide you a clear target for your ground and pound drills. If you’re looking for the best grappling dummy that will allow you to train both standing up and on the floor, the Celebrita Grappling Dummy is a fantastic option. If you’ve ever seen the film “Fox Catcher” you may recognize the Title MMA Dummy, as it’s incredibly similar to the one Mark Shultz uses in the beginning to practice take downs. 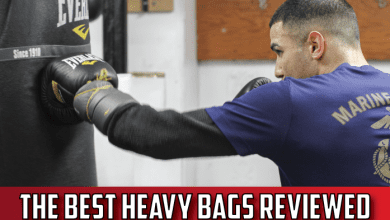 This nifty little grappling dummy can also double as a hanging heavy bag and is one of the most versatile models on our list. The Title MMA Grappling Dummy can be used to train your take downs, striking, grappling, ground and pound, submissions and heavy bag workouts. There isn’t really another dummy that can provide such a well-rounded training session. The dummy itself comes in two sizes, 70lbs (64”) and 100lbs (68”) and comes pre-filled and ready to go out of the box. Super strength synthetic leather is used to line the exterior, which ensures that the dummy is long lasting and durable. A removable hanging chain and two-rubber tie down cables come alongside the dummy that allows it to double as a heavy bag. 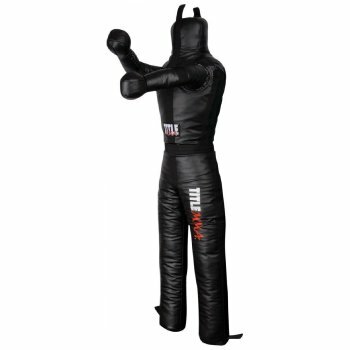 Overall I think it’s safe to say you can go wrong with Title MMA Grappling Dummy. Title are well known for making some of the most durable equipment on the market, and their grappling dummy is no exception. The Ring To Cage Grappling & Submission Dummy is an excellent choice for anyone looking to work on his or her groundwork, without the need of a training partner. It’s worth noting that the dummy comes in a kneeling position, which means that it can’t really be used for running stand up drills. 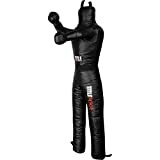 Instead, the Ring To Cage Grappling Dummy is better suited for groundwork training, for example practicing in full guard. You could also place it in a number of other positions like on its hands and knees to practice taking your opponents back. The limbs of the grappling dummy provide a nice amount of resistance, without being too hard to move. Of course it’s nothing like using a real training partner, but it’s as close as you’re going to get using a dummy. 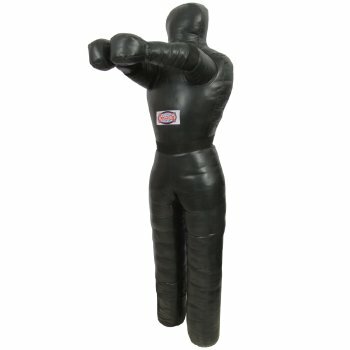 If you’re on a budget and looking for the best grappling dummy for developing your ground game, you’ll be pleased to know that this is one of the cheapest items on our list. Not only is it cheap, it’s incredibly durable and will be a reliable training partner for the many an hour on the mat. Manufactured using high quality, military –grade vinyl, the Combat Sports Submission Dummy is one of the most durable items on our list. The vinyl material also prevents the dummy from absorbing sweat and makes it a lot easier to clean. The dummies upright position allows you to train both standing up and on the ground. Although the dummy is great for training an array of takedowns and submissions, its arms are in a fixed position, which unfortunately means that you can’t fully extend your arm bars. I feel like I’ve said this a lot in this article, but I just want to repeat it one final time. Make sure you don’t buy a grappling dummy too heavy or it will be too hard to move around and will ruin your training. One of the best aspects of the Combat Sports Submission Dummy is that it comes pre-filled. This is great as filling up a dummy can take ages and it can be hard to find suitable filling material. Overall, the Combat Sports Submission dummy is able to withstand an absolute beating and will be a reliable training partner for many years to come. How To Fill A Grappling Dummy? The best grappling dummies will often have both filled and unfilled options for you to purchase. By purchasing an unfilled dummy, you can save yourself a bit of cash, however be prepared to spend a fair amount of time filling it up. There a number of different materials you can use to fill the inside of your grappling dummy. Some popular stuffing materials include shredded paper, shredded textiles like blankets and towels and even sand. You start by filling up the bottom and work your way towards the top. To make sure each limb is completely full, you can use an object like a broom to stuff it down. Try and make sure you take your time and fill up every available space inside the dummy. Can a Dummy Replace a Training Partner? You shouldn’t completely replace your training partner with a grappling dummy. Instead use the grappling dummy when you have no one else to train with or when you’re training at home. A real partner will be able to resist your moves and give you a more realistic practicing experience. As opposed to a dummy that won’t allow you to practice your submissions against an opponent who’s trying to escape. Here are some videos to show you some different drills you can run with your new grappling dummy. This awesome video by Tj Miller will run you through the 10 Count Drill. This is a great exercise if you’re new to MMA as it will get you comfortable in a number of dominant positions. 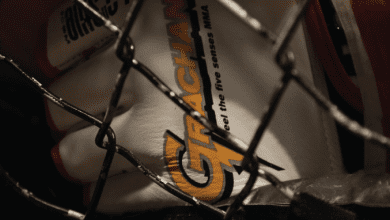 Also if you notice, he’s using the Title MMA Grappling Dummy we have discussed in this article. Moving onto our next video by Raw Warrior. This is a great drill to developing a number of submissions from the full guard position. 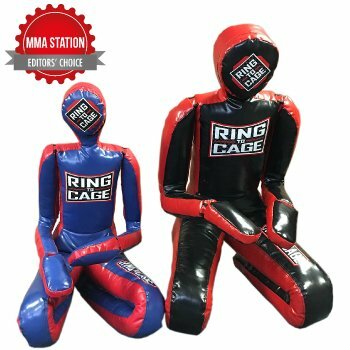 Ring To Cage are an incredibly popular brand of fight gear whose long lasting and high quality products have one the hearts of many fight fans out there. They offer a whole range of fight gear from BJJ Gi’s to boxing gloves, all of which are made to an exceptional standard. 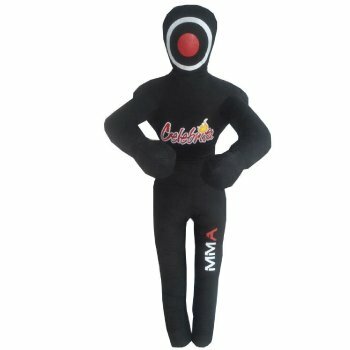 Celebrita specialize in manufacturing MMA dummies and punching bags that are a common site in gyms across the globe. 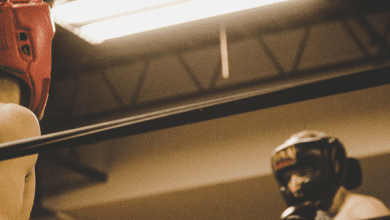 Unlike Ring To Cage, they ​focus solely ​on MMA equipment and over the years have become a master in their craft. Hopefully our grappling dummy reviews and comparison table has helped you to determine the best grappling dummy for your needs. As they do cost a fair amount of money, plenty of time should be spent making sure you find a dummy that is both long lasting and allows you to train to the best of your ability. If you’ve got any questions, please feel free to comment below. What Is The Best MMA Headgear? 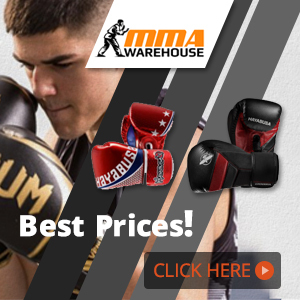 What Are The Best MMA Gloves?